Dr. Ryan Noah of Tulsa offers Snap-on Smile for an affordable smile makeover that will give you an instantaneous and beautiful smile without the cost of more expensive porcelain veneers. They don’t last forever (generally about four years), and are not the drop dead, gorgeous smile you’d get with veneers, but they are a great choice for special events like a wedding, class reunion, an important interview— any event where you want a beautiful smile without the large price tag. They are made from a crystallized acetyl resin that is extremely tough and durable. The beauty of this appliance is that they are designed to snap right over your existing teeth. First, you meet with Dr. Ryan Noah for a complimentary consultation to talk about the shade and shape of teeth that you want for your smile makeover and to see if you are a candidate for this procedure. If it is determined that you are a candidate, you will schedule an appointment for Dr. Noah to take an impression of your teeth. A hardened plaster model is made from that impression and sent to the laboratory along with Dr. Noah’s detailed instructions that you’ve designed together. When the Snap-on Smile comes back from the laboratory, you simply snap it over your teeth. It’s that easy. You can use them whenever and wherever you desire. You can even eat with them, although it is very important to keep the appliances clean after every meal. If food particles become trapped they can cause problems with your teeth and gums. So every time you eat, simply remove them, clean your teeth, and pop them back into place. Following these simple steps will ensure they last for the duration of their design. 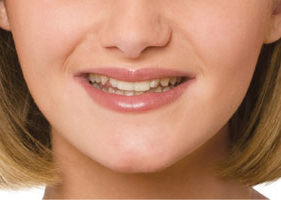 In the images below, you can see how this temporary smile makeover can give you beautiful results. You will notice some discoloration and an unevenness in the before image, while the patient’s teeth are whiter and straighter in the after photo. If you would like to know if you’re a good candidate for snap-on smile, you may call our office to schedule a complimentary consultation. Dr. Noah can answer any questions you have. If you prefer, you may click here to request an appointment online.